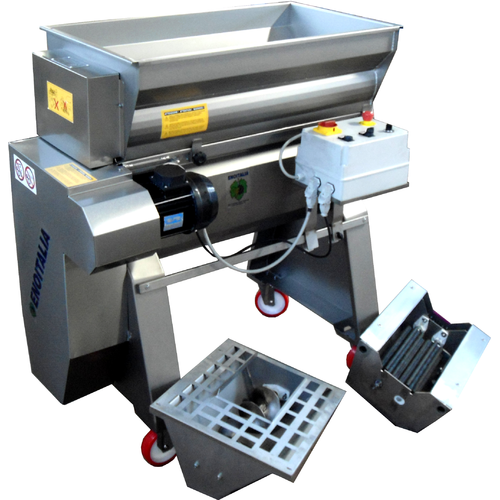 A great machine for the small winery who is seeking a gentle processing but wants to avoid a high price tag. This is the only machine on the market near this price point that allows you this level of flexibility. 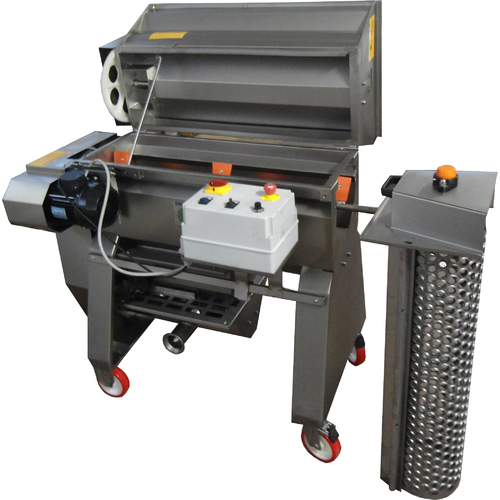 The most important feature is variable speed control, via a built in electronic frequency drive, that allows you to slow down or speed up to best adjust the machine to the fruit you are processing. The second key feature is an adjustable rubber roller assembly that can be removed when destemming only is preferred. 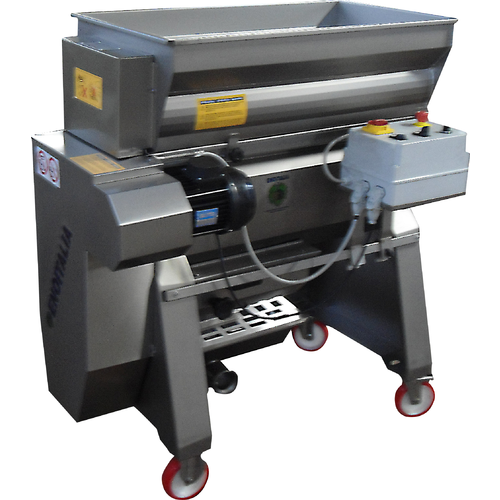 The reception hopper can be connected to a rubber impeller must pump for an affordable must moving solution or can be removed to allow other ways of moving the must. The collection tank, located at the bottom of the machine, consists of a stainless bin with a stainless auger feed that is driven by the machine. It pushes crushed grapes into your awaiting rubber impeller must pump where the must is moved into your fermenter. However, you can remove the collection tank altogether, allowing the must to drop via gravity, which allows you to do one of two things. 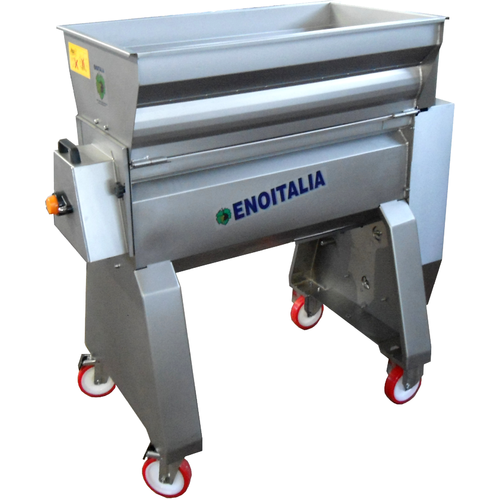 First you have the option to wheel in a true commercial quality eliptical must pump, such as the Enotialia Gamma 80, designed for commercial crush pads. Eliptical must pumps are big pumps with 3" outlet tubing that allows for a gentler transfer and are also better for dry (small berry, less flesh) fruit. The Gamma 80 is the smallest version of a true must pump, perfectly suited for this machine. A second option if you remove the reception hopper is to just allow the fruit to drop via gravity into containers and transfer that manually to macrobins. Of course the latter option is only feasible with a strong back and very small lots, but sometimes that is a nice option to have. The collection tank has a feed outlet on both sides. The side you are not using will need to be capped with a 2.5" end cap, clamp and gasket which are not included. The rollers can be unbolted and removed from the machine, allowing for destemming only. It is a nice option to have for some fruit types you may choose not to crush. 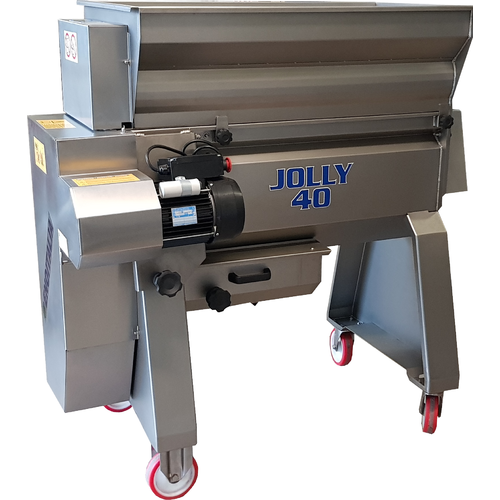 If you are consistently doing late harvest grapes with dry stems you should choose the Jolly60. If you are running large volumes we really recommend you choose the Jolly 60. The standard basket is not ideal for processing Muscadine grapes. Approximate dimensions of 52" x 28" x 53.5"